Last weekend we organised a Flashcamp in Wellington; I’ve already talked about it at Human Factors, so no details about here. 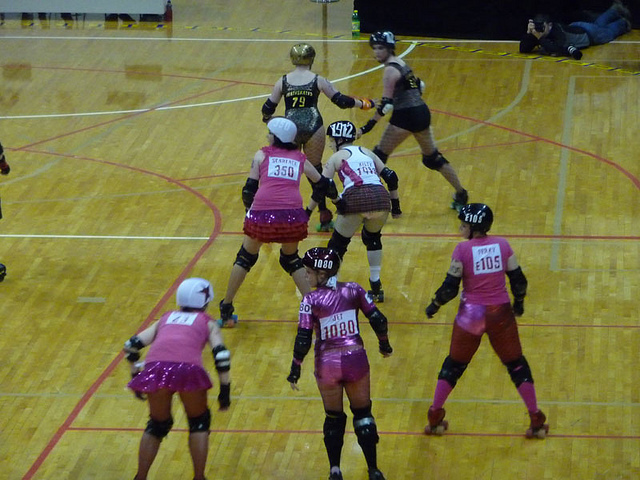 But I didn’t want to miss the chance to show you some photos of the Roller Derby, which we attended after the Flashcamp with speakers, sponsors and helpers. Never heard of Roller Derby before? It’s a pretty bizarre kind of sports, in which girls on roller skates go round and round in an arena, trying to block attackers coming from behind (well, in a nutshell). Look at the pics (all taken by Carly Gooch) to get the idea.